Jumpsuits are one of the hottest trends, especially during the summer. I have been wanting to try one out. I was given the opportunity to do just that thanks to Luxe and Curves. Find out my thoughts & more below. 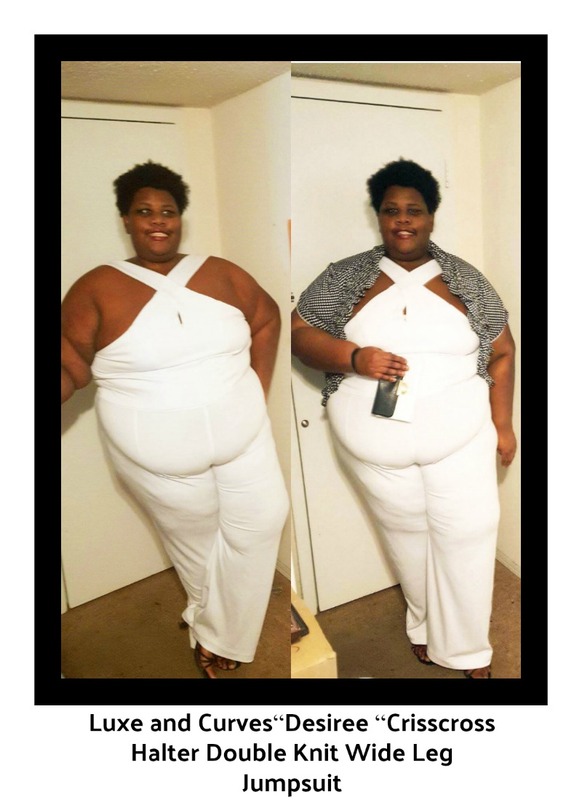 Last month, I was sent their “Desiree “Crisscross Halter Double Knit Wide Leg Jumpsuit. Here are my thoughts. 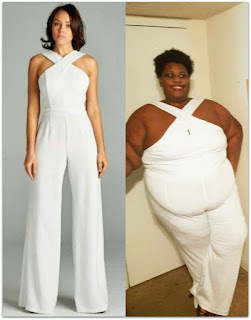 I received my jumpsuit in White. It really allows the details stand out. There are some events (Yacht Party, Weddings & etc.) for wearing White. The downside to wearing White is it gets dirty easily. Of course, there is that pesky fashion “faux pas” of when you can wear it. Lucky for you who don’t want to deal with that hassle it is also available in Red. As you can see it doesn’t fit on me the way it does on the standard model (seen left). Please keep in mind I am 5’9 and wearing heels. It was a little more form-fitting on my midsection than I expected. One of my favorite details of the jumpsuit is the wide legs. I tend to purchase a lot of my pants (i.e. jeans) with this cut so I was excited that it was included. Other details I want to mention are the crisscross bodice and wide straps. I appreciated the wide straps because they didn’t dig into my skin. I am wearing the jumpsuits two ways. First, I wore just the jumpsuit (left). Then I added one of my favorite shrugs and Forever Selected by Paula Abdul Mod Deco Clutch(right). However, you can style it to your own personal taste. Overall, I was impressed by this jumpsuit for my first time ever wearing one. I think I should have gone up a size for a better fit. Ladies, make sure to have a good strapless bra and shapewear for a smooth look. If you aren’t big fan of white I would select another color. For our readers, I have a special code. Use discount code #MOSOF17 to receive 30% off at checkout. You know I couldn’t leave you all out. 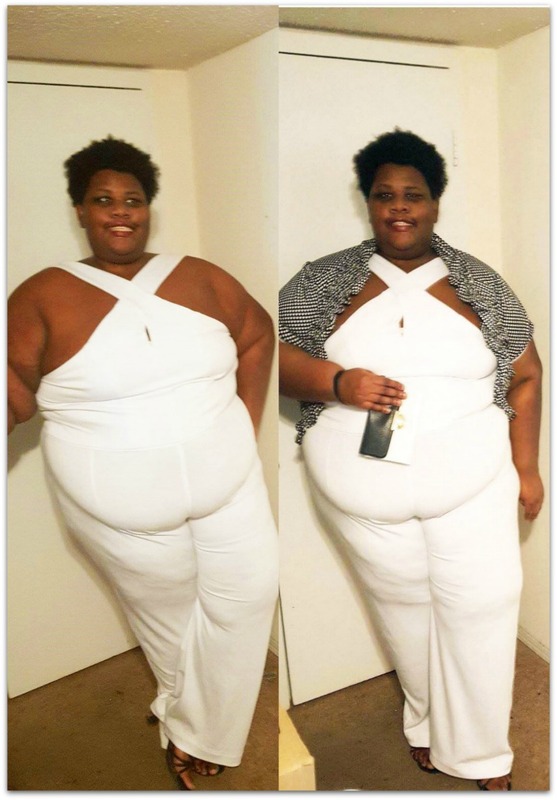 Find “Desiree “Crisscross Halter Double Knit Wide Leg Jumpsuit & more by clicking here. Special thanks to Luxe and Curves ®. Be sure to look out for their upcoming collection and more. You can find them at their website, Facebook, and Instagram. Are you a fan of jumpsuits? What did you think of the review? Let us in the comments below. All opinions expressed on the blog appear courtesy of Tamarah Brown for My Own Sense of Fashion © unless otherwise stated (i.e. interviews, guest blog posts and etc.). No use or reproduction may occur without the written consent of the author. This blog uses affiliate links & generates a small commission from purchases.